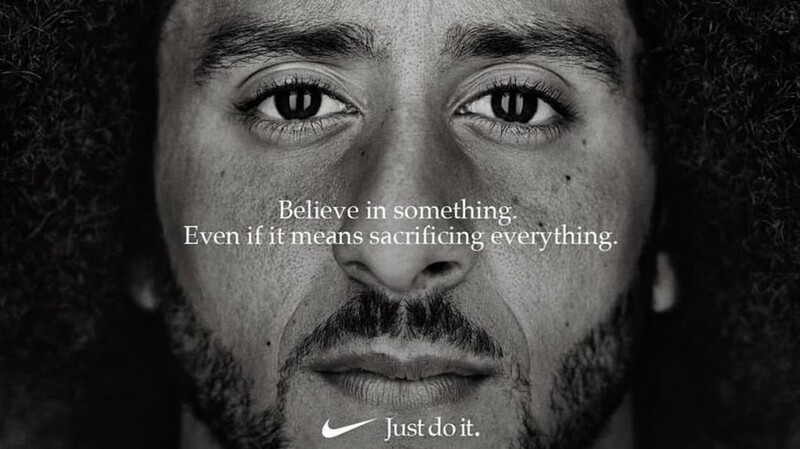 On Monday, Nike unveiled an ad celebrating the 30th anniversary of its iconic slogan, “Just Do It.” The black and white one-sheet features a close up image of Colin Kaepernick, the former NFL quarterback who introduced kneeling during the national anthem as a protest against racism and police brutality in 2016, as well as the quote: “Believe in something. Even if it means sacrificing everything.” Kaepernick, who is currently suing the NFL for allegedly blacklisting him due to his protest, was also revealed to have remained on Nike’s endorsement roster since his retirement last year. This means he stayed on the brand’s payroll even as the President of the United States called for his head. Kaepernick’s supporters heralded the ad as a revolutionary moment, in which a brand positioned itself on the right side of history. Naturally, the campaign also caught the ire of conservatives, who flooded social media with calls to boycott the 29 billion dollar brand, and shared videos of themselves destroying Nike memorabilia (which they had, presumably, already purchased). Some saw Nike’s move more cynically, noting that Kaepernick’s jersey has remained a top seller for Nike, and questioning how altruistic a move the brand is making, and whether in fact it is distracting from its own ongoing internal scandal. There is, of course, ample room for critiques of any form of corporate-backed activism. It has become so commonplace for brands to align themselves with progressive movements online that it’s become difficult to parse out what any messages mean any longer. The mainstream adoption of feminist language, for example, has created a whole cottage industry of mindless merch that carries the aesthetic of resistance without any of the bite. Trump’s presidency has added a layer of ahistoricism, too. New York streetwear label Awake recently released shirts celebrating Robert Mueller, the special counsel in the ongoing investigation into Trump’s ties with Russia – seemingly forgetting, or ignoring, the fact that Mueller was also a major architect of the Iraq war. But the specifics of Nike’s ad matter. Colin Kaepernick made the bold move of challenging America’s pernicious white supremacy in front of an audience that remains largely white. He forced football fans to confront the sport’s lopsided treatment of black players. He inspired rabid anger from the president, effectively proving the efficacy of his actions. For Nike to come out in support of Kaepernick – and for them to have been paying him this whole time, as the NFL abandoned him – is more than a marketing stunt. Sure, it definitely looks good for the brand, especially in the eyes of a sizeable number of consumers. But it is also making a very clear statement on an issue that most multi-billion dollar sports brands seem content to ignore. Of course, the fact that it falls on brands to make these statements, as institutions remain silent, raises messy ethical questions. Nike’s support of Kaepernick – and the fact that his message will now infect the entirety of the NFL’s football coverage thanks to the ten-year deal the brand has with the league – is an unambiguous win for anyone hoping to amplify the voices of those speaking out against systemic oppression in American society. But how much power should such brands have in the first place? Those, and other more existential questions about our relationships to each other and commerce, will have to meted out politically. No advertisement or campaign could possibly give us the answer. But although it’s true that brands, ultimately, set out to make profit, for Nike this campaign was a risky move. Shares of Nike stock fell two points on Tuesday, following the mass boycotts on social media. Even beyond financial ramifications, confronting white supremacy remains a distinctly dangerous act. We are only three years removed from the massacre at Charleston, and mere months removed from the murder of journalists in Maryland, spurred by right-wing rhetoric attacking the media. In a climate where online masses can quickly become real-life violent mobs, coming out in such public support of one of the most vilified sports figures in recent memory would be a needlessly risky PR stunt if there wasn’t something real behind it.